The new border crossing will allow more trade and tourism into North Korea. China and North Korea have reportedly opened a new border crossing over the Yalu River, one of three natural boundaries between the two countries, Bloomberg reported Monday. The border checkpoint has been established near a newly-constructed bridge connecting the Chinese city of Jian with North Korea's Manpo, according to Chinese media. Construction of the bridge began in 2012 and took four years, but the border crossing was not opened in 2016 due to UN Security Council sanctions imposed on North Korea, according to South Korea's Yonhap news agency. — Nikkei Asian Review (@NAR) 4 декабря 2015 г. ​This year, the sanctions did not prevent several Chinese tour buses from traveling into North Korea and returning, marking the border crossing's opening, according to Bloomberg. The checkpoint, complete with an "advanced customs facility," will allow both passenger and cargo transport, the report says. The opening comes as bilateral relations are improving, and North Korean leader Kim Jong Un has visited China on four occasions over the past 13 months, NHK World Japan reports. The Manpo crossing is the fourth crossing on the Chinese-North Korean border. The Chinese border used to be the least protected North Korean border, allowing North Korean refugees to cross into China with relative ease, New York Times reported back in 2006. Over the years that followed, China began construction of fences along the border. Beijing continues to trade with Pyongyang, despite international sanctions severely limiting the amount of goods that can be traded with North Korea. In 2017, China's trade with North Korea declined by more than 10 percent to about $5 billion, Bloomberg reports. The new border crossing is expected to increase bilateral trade and tourism between the two countries, but Bloomberg points out that it is unclear how the new border checkpoint will operate under the sanctions regime. According to the report, US President Donald Trump has secured Beijing's backing for escalating rounds of sanctions against North Korea. In the meantime, South Korean President Moon Jae In is expected to discuss economic penalties imposed on Pyongyang during his meeting with Trump at the White House Thursday. 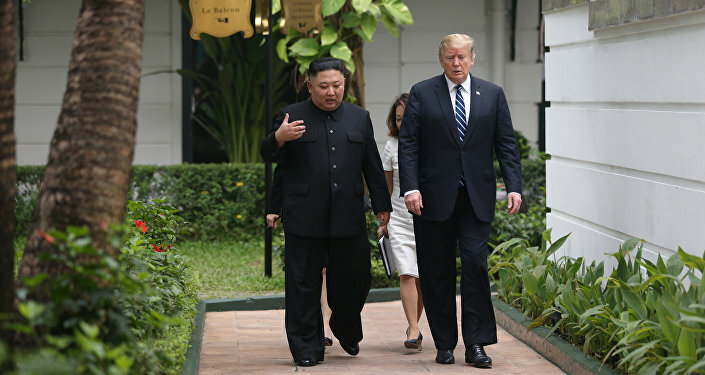 Moon, a proponent of the reconciliation of the two Koreas, has repeatedly acted as a mediator between the US and North Korea.